They were born in a "state" that no longer exists, most to fathers who are dead and mothers whose countries don't want them back. These are the children pouring out of Baghouz. Their grimy faces are the only ones visible in the sea of black veils worn by their mothers, packed in the back of a dozen pickup trucks spiriting them away from the Islamic State group's last holdout in eastern Syria. There are infants as young as three months old, their ceaseless, hungry wails synching into a single howl. The older toddlers stare in silence at the gathered journalists. They seem to be dressed in everything they could pile on: tiny knit sweaters and hats, puffer jackets, blankets. It is hard to tell how thin or young their mothers are under their all-encompassing black robes, but their eyes are gaunt and sunken, their bone-thin hands blackened with dirt. Food and safe drinking water have been scarce for weeks as the US-backed Syrian Democratic Forces closed in on the last IS enclave near the flat, desolate village of Baghouz. 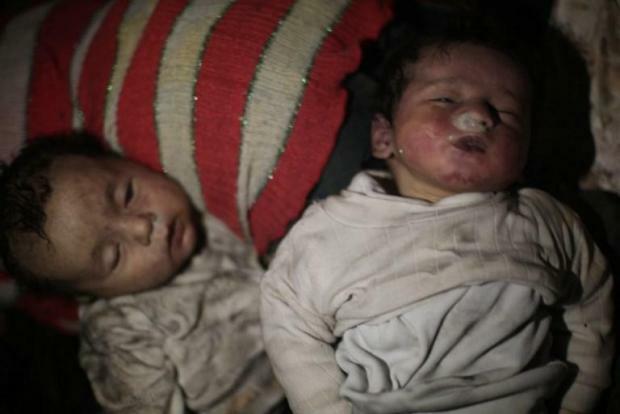 But somehow, even as the "caliphate" was dying, babies were still being born. Khadija is one year old, born under IS in the eastern province of Deir Ezzor. She is swaddled in a thick blanket by her mother, a 17-year-old Syrian girl from 500 kilometres away in the northern city of Manbij. Her father, just as young, has been rounded up by the SDF and placed into another truck with dozens of men. Asked what she hoped for her daughter, Marah pulled back the blanket from her daughter's face and just stared blankly. There are other nationalities too -- Iraqi, Turkish, Russian, Ukrainian and French. What awaits them? An uncertain future in a pair of displaced persons' camps run by the Kurdish administration of northern Syria, where thousands of others like them are already being held. To get there, they cross hundreds of kilometres of desert plain in the open-back trucks, exposed to the rain and other elements. On either side of the desolate route lie the tattered belongings of those with little else: a torn suitcase, a ripped grey sweater, a navy blue stroller turned on its side. At least 35 children have died on the route or just after arrival, according to the United Nations, most of hypothermia. In the Al-Hol reception centre, women and children - most of them under five - sit on piles of blankets, waiting for a tent to become available. In the nearby health clinic, veiled women lay their haggard toddlers on a table for a doctor with worn-out eyes to examine. A 19-year-old with an infant on her hip emerges from the women's clinic. "I just found out I'm pregnant."